The ninth Permaculture design principle is ‘Diversity’ – polyculture and diversity of beneficial species for a productive, interactive system. The design principle of ‘Diversity’ is quite a complex one, as it is built upon several ecological concepts, which we must first understand to fully comprehend the scope and intent of this principle. One of the key elements to the Permaculture design principle of diversity is the concept of a polyculture, which is defined as the raising at the same time and place of more than one species of plant or animal. It is important to point out before we go any further that this is is the natural state of affairs, the status quo of Nature. Biology describes natural ecosystems as a complex web of life, where living organisms exist in beneficial relationships to each other. Conversely, monocultures, commonly seen as the cultivation of a single crop in a given area, do not exist naturally, they are an artificial human invention, they lack diversity and they are ecologically unstable – for example, if you leave a farm of lettuce on its own after a year it won’t be ‘lettuce only’ for very long! Now, let us consider the building blocks of these polyculture systems. Nature builds living ecosystems from the various species that are available in an area, and does not discriminate on the basis of whether they are indigenous, native or exotic species. These aforementioned groupings by geographical location are human classifications, plants have evolved to move around the planet by design, and they have been doing so for hundreds of millions of years! Ecosystems are dynamic, ever-changing living systems, not fixed human-conceived artificial systems. Even though they change, grow, and evolve over time like all living things, Nature forms stable ecosystems from different species that can grow well together in a beneficial relationship to each other. In contrast to monocultures which degrade in integrity over time, if you leave a stable biodiverse polyculture on its own, it will increase in stability and resilience as the number of harmonious relationships between the different species increases as time passes. Another key feature of diverse ecosystems is a high degree of natural order, but for those of us more familiar with artificial human systems, order might no be exactly what you think it might be! Implicit in the design principle of ‘Diversity’ is the concept of order. Here are two pictures of vastly different plant systems, and the question is, which one has more ‘order’? 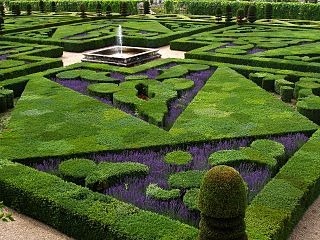 Well, if you chose the formal garden as having more order, you’d be totally incorrect! We humans mistake tidiness for order! They are not the same when we are talking about living systems! The formal garden pictured above is what we end up with when we take conventionally garden or farm practices to their ultimate expression. This is how humans picture plants growing, not how Nature grows plants. Artificial groupings of plants – grouped by species, where all the same ones are placed together, or grouped by colour, texture, leaf shape, etc. Rectilinear designs – unnatural shapes such as straight lines, squares and rectangles. Strict planting patterns – plants are planted in strict repetitive pattern such as rows. Monocultures – large areas are planted with one type of plant. Highly defined boundaries – a strong emphasis on where the garden bed or growing area ends and another area begins, areas are clearly partitioned and separated from each other. Extremely energy and labour intensive to maintain the level of tidiness. Aesthetics – plants are generally not regarded as living organisms like your pet cat or dog, or as as living organisms that exist in complex ecological relationships to each other and their environment. They are regarded as inanimate ‘design features’, which can be used in human artistic expression, where the garden bed serves as a canvas, and the various plant species are the palette of paints, so we humans can ‘paint with nature’ and create ‘beautiful gardens’ – what is beautiful is obviously a subjective aesthetic preference of course, many may disagree about whether a human designed garden is beautiful, but nobody can honestly say that nature is ever ugly! Convenience – plants are basically seen as a resource to be exploited, especially in commercial ventures where financial profits are the driving factor. Monocultures planted in rows make it easier to harvest by machine, or by lowly paid labourers who hand pick the produce. The growing of monocultures serves commercial demand, supplying huge volumes of one type of produce all at once, something that you would never do when feeding a family or a sustainable community, where you would want extended cropping of a variety of produce throughout the year. The problem with these conventional gardening/farming approaches is that they are extremely wasteful of energy and resources, often produce extensive ecological damage and pollution, and are ultimately unsustainable. As a cautionary note, before we can create permaculture designs, we need to be able to clearly understand the reasons for conventional gardening/agriculture practices, for the sake of perspective. I cannot emphasis this enough. If we unquestioningly adopt these practices, we run the risk of building conventional gardens ourselves, with all their associated problems, mistakenly thinking them to be ‘permaculture gardens’. Now that we have cleared up any misconceptions about order in respect to conventional horticultural and agricultural practices, we now know better and have no excuses for thinking these practices are compatible with a permaculture design principles! So, what is Natural Order then? It is the order that results from the harmonious relationships and cooperation between different species in an ecosystem, which enable it to function as a whole and integrated living system. Let us look further into the nature of these relationships that are the basis of natural order, and the benefits they provide. There is more to the concept of diversity in a Permaculture design than just the total number of different species or design elements all lumped in together. In Nature, diversity is ‘by design’ if I can use that expression, it is not just a random collections of different species placed together, it is a collection of different species that exist cooperatively to create stability in the natural system. – are crucial in natural ecosystems, and as such are important elements in the Permaculture design principle of ‘Diversity’ and in the Permaculture systems we design. We must remember that all things in Nature don’t necessarily co-exist harmoniously. 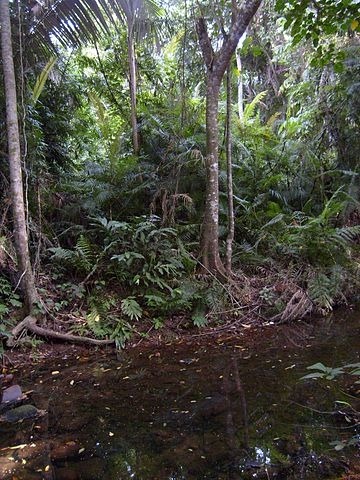 Some species compete with others for water, nutrients and light, and tall trees and plant can suppress lower ones for example. Others may be detrimental to each other, as in the case of allelopathic plants and trees which inhibit the growth of others, such as walnut trees, Eucalyptus and Casuarina trees or ‘bad companions’ in companion planting, plants which are detrimental to each other when grown together, such as the allium (onion) family which is detrimental to legumes for example. Some plant species may harbour or encourage pest species, or diseases, by providing a habitat for the pests to overwinter (survive over winter) in, or by acting as alternative hosts which support the survival of pests or diseases. Animals can enhance and complement a natural system, but an over-presence can stress the system and cause damage, such as overgrazing, soil compaction, destruction of plants and trees, etc.. It follows that when we create a diverse system, we must carefully choose what species we incorporate into the system by choosing ones that do not harm each other. Furthermore, if we need to include species that may be detrimental to each other in a design, we need to devise ways of separating them or keeping them apart to reduce the possibility of damage to each other. Ultimately, what is most important in diversity is not the total number of elements (plants and animals) in a system, but rather the total number of functional connections or functional relationships between these elements within the system. Our intention is to create groups of elements (plants animals and structures) which all work beneficially together, this grouping of elements is called a guild. In Permaculture, a plant guild is a community of plants that grow well together because they benefit and support each other, forming an ecological ‘mutual support network’. Assist with its health – increase growth, protect from pests & diseases. Help manage it – reduce root competition from unwanted plants, add nutrients to spoil, convenience in harvesting plants used together for culinary purposes. Protect it from the elements – create microclimate, protect from frost, heat and wind. Plant guilds are tied in closely with Companion Planting. The Native American Indian people used plant guilds to grow food, the most well know is the ‘Three Sisters’ Guild , the tradition of interplanting corn, beans and squash together. In this guild, a mound of soil is made, corn is planted in the centre of the mound. Beans are planted in a circle around the corn. Around the beans, at the edge of the mound, the squash is planted. The corn provides a growing support for the beans to climb. Beans are nitrogen-fixing legumes, symbiotic Rhizobium bacteria in their roots fix nitrogen from the air to a form usable by plants, improving soil fertility for the next years corn. This reduces fertilizer requirements for all plants. Beans vine through the corn, helping to support them so the wind can’t blow them over. Squash plants, a vining ground-cover, create a living mulch, which preventing soil water loss by evaporation, and shades out any weeds to stop them growing. This reduces water requirements for all plants. 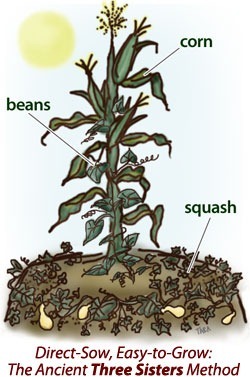 Squash plants have prickly leaves and stems, which stop animals eating the beans and corn. When plants die down, all the organic matter builds richer soil, can be dug to enrich the soil. Guilds can also be constructed with plants and animals. A common practice is to run chickens underneath fruit orchards – the chickens will eat any fallen fruit, and will also eliminate any pest insects from the base of the fruit trees. 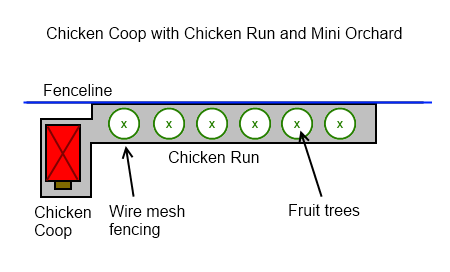 A chicken run, a permanently fenced long ‘run’ can extend below a line of fruit trees, giving the chickens regular access to the area where they can exercise and obtain extra food. Any pests and fallen fruit are eaten by the chickens and their manure fertilizes the trees and returns the nutrients to the soil. The chickens will also eliminate any weeds, creating a synergistic system where both elements in the system, the chickens and the fruit trees, mutually benefit. In such a system, chickens can eliminate codling moth from apple orchards quite effectively. In summary, the design principle of Diversity shows us that, just like in Nature, when we combine many plant species together that have a beneficial relationship to one other, they in fact grow better, produce higher yields, resists pests and diseases and are overall much more resilient in such a system. When we include animals in our design and place them where they can work harmoniously with the rest of the system, we further gain many more benefits from the synergy created. The most important point to remember with the design principle of diversity is that what is important is the total number of functional relationships between elements in the design, and not the total number of elements themselves.